This morning (6/29) we arose early to try to make a big jump down the coast. Before we could leave though we had a couple of projects that needed to be completed. We have been having some problems with the battery that we use to run all of our cabin niceties. Fortunately we had a spare and we dug it out and swapped the new battery into the engine room. 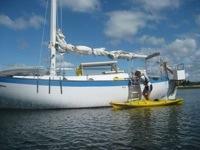 Even after eating breakfast and installing the new battery we were still able to haul up the anchor at 0730. We used our anchor windlass for the first time, after I couldn’t just pull the anchor out of the sticky mud on the bottom of Cocktail Cove. Maybe that is what the guide book meant when they said some people just can’t bring themselves to leave….. A short motor around the north end of the island and then we raised sail. We then proceeded to sit in essentially the same place for the next hour…..but we were underway. Eventually the wind built in and we headed down the coast. In order to allow our new battery to charge via the solar panel we left the chartplotter off today and used the paper charts while taking visual sights on many of the available aids to navigation. 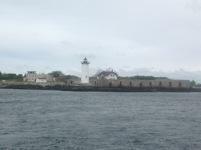 After rounding Cape Small we headed for the inside of Seguin Island. This may have been a mistake. 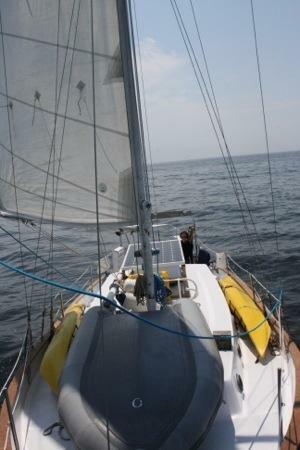 At first everything was going well, the wind was behind us, and we were making good time. A little while later the waves were getting larger and we were starting to bang around a little bit. We decided that it would be a good idea to stop and check out the lighthouse on Sequin Island, we had heard that it was definitely worth a stop. 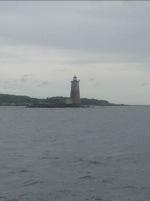 Here is the lighthouse about the time we decided to head over for a visit. The current then continued to build and we were soon sailing almost as fast as we could just to stay in the same spot. A quick 1 hour sail ended up taking us over 3 hours through confused seas (waves from multiple directions) to reach Seguin Island. 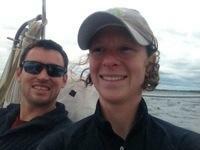 The first mate did a fantastic job of steering in these difficult conditions. 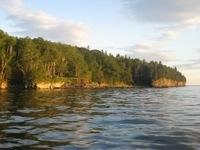 We cut between Seguin Island and Ellingwood rock, and headed into the cove. This is by far the smallest and least sheltered place we have stopped so far. There were waves breaking inside the cove! 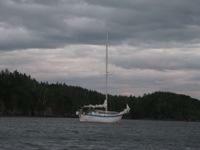 We ended up on a mooring near an Outward Bound boat. 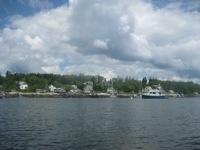 After a wonderful time on Seguin we headed up the Sheepscot river for 5 Island Harbor. We sailed with the current for about an hour and then as the tide changed we decided to fire up the diesel and motor the remaining 3 miles into the harbor. 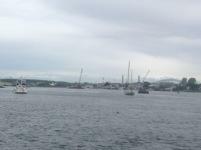 We arrived to find a wonderful little harbor that seems to be packed full of boats. Shortly after we arrived a thunderstorm passed just north of us. Glad it missed us! 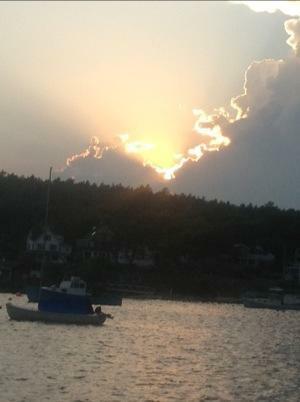 A successful day of sailing! Upon our arrival at Jewell Island, we were eager to explore. 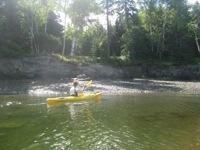 There was a cove beckoning just ahead of our anchorage, accessible due to low tide exposing the beach, and so we decided to take the kayaks for a spin to get a closer look. Fortunately, with the addition of a ladder, we were able to board the kayaks with ease. As dusk fell, we enjoyed beautiful horizon views of the island and we were even able to sneak up on two herons who were hunting in the cove. 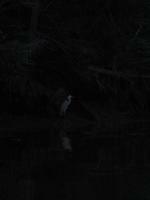 (The photos are dark, but there are two herons in the first photo…one in the tree and one on the shoreline. Just one heron in the second photo). The next morning I awoke ready to get the day rolling…but…wasn’t really sure how exactly to do that. It felt as though I was on vacation but didn’t have any plans! I washed my hair, which was exhilarating, and then completed a quick varnishing project (the plywood support underneath the propane tank box) while the captain was getting his beauty sleep. We ate a light breakfast in the cockpit. Percolator brewed coffee is mighty tasty and sure does help the captain to get a good jump start! Brian had reminisced so about Gene’s bachelor party that took place on Jewell Island. 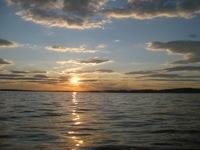 He shared that it had nice hiking trails and several campsites. We planned to hike on Jewell Island for most of the morning and so packed a lunch, water, and the camera. 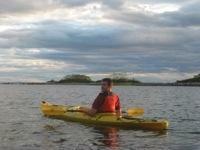 The kayaks were launched off the deck and we headed out for adventure! 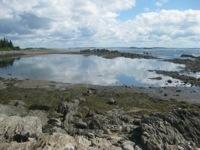 We clamored up the side of the rocky beach, once again accessible due to low tide. Conveniently, at the top of the beach was a campsite with labeled trails. 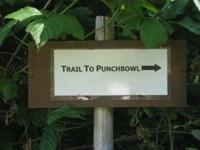 Our first destination was the Punchbowl. 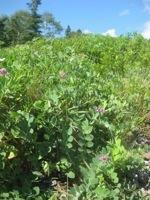 A rocky beach, the Punchbowl was lined with beach peas. 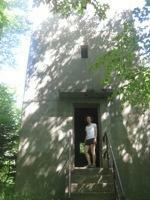 We found our next trail toward the south side of the island and ventured toward the tower. As soon as we left the beach, the mosquitoes came out in full force! Our hike became more like speed walking as we hustled to avoid as many mosquito bites as possible. 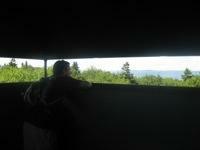 We found the tower, a WWII submarine spotting tower, and took refuge. 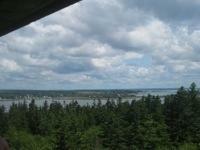 The tower provided a cool temperature in a bug-free zone and had a glorious view at the top. 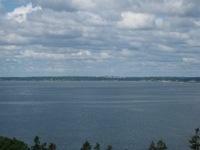 After taking in the view, we hustled once again down the trail on the southeast side of the island. 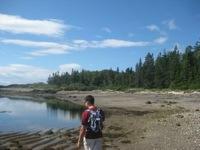 We came across a familiar campsite, Gene’s bachelor pad, and took another mosquito break by detouring to the beach. Those buggers are so blood thirsty they follow you! We walked the beach as long as possible then put on our game faces and battled the mosquitos on the shortest possible route back to the kayaks. Well, we didn’t really start the day with a plan A and were now moving onto plan B. 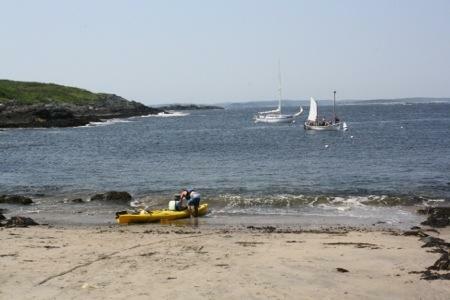 We kayaked right past Rode Trip and headed toward our westerly neighboring island, Cliff Island. 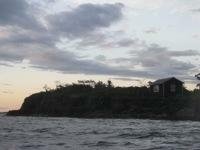 Cliff Island had no mosquitos! We walked the main, dirt road for a while and got the feeling that we were back in PA. Each local that passed by gave a wave and those within hearing distance said hello. We strolled past a pick-up game of basketball played by some children on the court of the one-room schoolhouse. 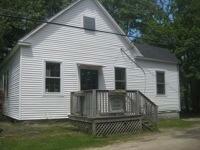 As we had learned from the guide book, the Cliff Island School is one of the few remaining one-room schoolhouses still functioning during the school year. Remember that lunch we packed when we set off? 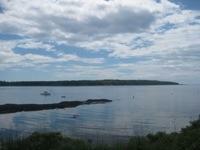 We were able to eat it, bug free, at Griffin’s Cove with a great view of Jewell Island. After lunch, we kayaked back to Rode Trip. I was able to articulate to Brian that I was entering vacation mode but searching for a plan, routine, etc. We spent a few hours charting and pre-planning for the day ahead. 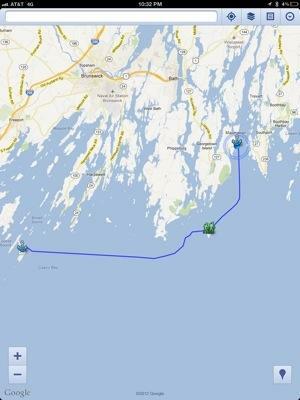 We decided we would try to leap to Bar Harbor in hopes to meet with Ryan, Jocelyn, and Steve during their July 4th vacations. PHEW! Some plans were achieved! We had appetizers and cocktails in the cockpit, and made a toast to Cocktail Cove. 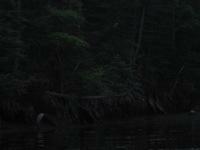 We set out for yet another dusk kayak before our early morning departure. We made good use of our rainy days in Portsmouth getting settled on Rode Trip and spending more quality time with friends. We BB-Q’ed with Darren, Katie, Annika, Scott, Nikki, Sunny, & Berkley. 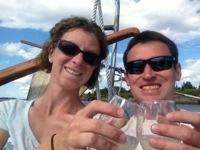 We docked at the Kittery Point Yacht Club for lunch with Andrew, Jen, & Aurelia. And we took advantage of one last $2 Tuesday at Fat Belly’s where the team “Rode Trip” consisting of Sunny, Berkley, Brian, & me competed at trivia – to no avail. Mike and Casey were able to see us off at Pierce Island with recommendations for vacation spots where he and Gail hope to join. As soon as the hand line is installed, we’ll let Mike know to swap fish recipes. 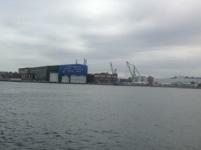 And now we say goodbye to our home port and set sail! 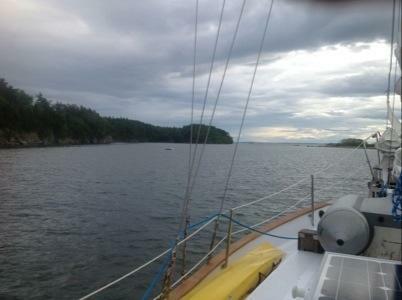 We sailed on a broad reach for 8-hours on Wednesday 6/27. 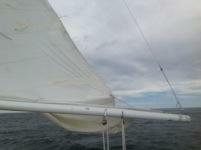 The wind was gusty, seas built as we got farther offshore, and the skies were cloudy with intermittent rain. Captain Brian decided to reef the sail; meaning we took down part of the main sail to decrease sail area and slow our speed. Slow our speed! Yes, we were heeled completely to starboard and “screamin” (Captain’s official term for moving quickly.) 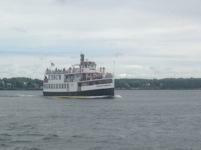 Rode Trip was holding 7.5 knots. Below, you can see where the main sail had been tied to lower part way. This went very smoothly because the first mate follows directions well and is very STRONG. 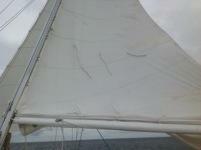 We were pleased overall and I was excited to have learned some new sail handling. 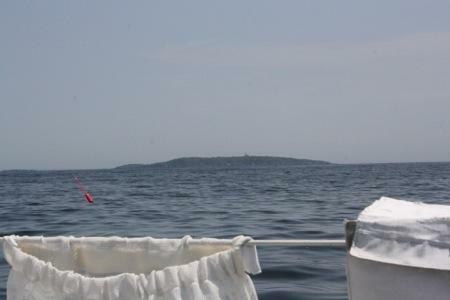 We reached Jewell Island at 1820 and set anchor off the west side of the island in Cocktail Cove. Time to explore!